David started supporting Wycombe Wanderers in 1999, prompted by his daughter’s growing interest in the game. While she went on first to be a mascot in the 2000/01 FA Cup run, and then to play for the WW Ladies team, he became a keen supporter of the Blues. A trust member since May 2012, David is a passionate believer in the fan ownership model, although since becoming a director of the Trust in 2016 he has found his ideals tempered with a heavy dose of reality. He is full of admiration for the time and commitment invested in the club over the years by the directors of both the Trust and the club itself and felt privileged to be elected to the Trust. He was subsequently appointed Corporate Secretary of the Trust. David qualified as a solicitor in 1981. 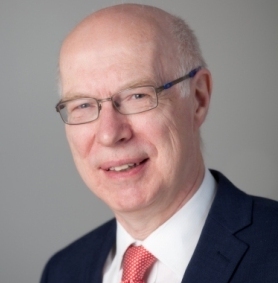 He is a partner in a City firm of solicitors and hopes that his more than 35 years of experience advising private and public companies on, among other things, the legal aspects of financial matters will be of benefit to the Trust, particularly in the current discussions regarding the future financing of the club. Sporting Director Andrew Howard has decided to resign from the Football Club Board at the end of October. He came into the Club in 2014 as Chairman, when it was in a parlous state after almost going out of the Football League at the end of the season. Since then he has been instrumental in changing the fortunes of the Club and putting it back on the road to sustainability. He has worked closely with Gareth Ainsworth over the last four years, which culminated in our promotion to League 1 at the end of last season. The Trust would like to put on record its huge appreciation of everything that Andrew has done for the Club. We are grateful for the time, energy and effort he has put in, often to the detriment to his own business and his personal life but are pleased to know that he will be continuing his involvement with the club both as a sponsor and a supporter. Working to improve cashflow in 4th quarter. July actuals close to budget figures (excluding player income). WWFC accounts audit in review stage, aiming for sign off in October. WWSGL audit moving to review stage. Legacy members list being constantly updated. Kiosk outsourcing confirmed, will start mid-September. Number of volunteers for car parking/programme selling increased. Work to improve/update Trust website agreed on a volunteer basis. Trust ownership has given the Club a level of stability that had been lacking previously. The Trust, a volunteer led, democratic organisation, passionately believes in the preservation of the heritage and history of our Club and seeks to share it with the wider community. The Trust is not constrained by the whims of individual Directors or owners. All Trust members are equal and anyone can be elected or co-opted onto the Trust Board and, from there, onto the Club Board. The Trust’s annual subscription of £10 per annum makes Trust membership accessible to all. If you would like to join the Trust, or if your membership has lapsed, now is a good time to join. Contact John Bignell at johnbig@btinternet.com or come to the Trust table in the Caledonian Suite on home matchdays.